ChemSee’s Nitro-Screen Kit is a bulk screening kit for all Nitrate-based Explosives. The Kit forms color when explosive nitrates are present. It is easy to use, even for unskilled personnel. The Kit is small (10x7x3″) and light-weight (450g) – make it ideal for use in the field or at checkpoints. The NSK-01 Bulk Screening Kit (140 tests) is available for large-scale testing at airports and other security checkpoints. The cost of testing for explosives using the NSK-01 Kit is significantly lower (per test) then the cost of doing the same screening tests using detectors made by competitors. Moreover, ChemSee’s Kit has a significantly longer shelf-life before and after the reagents are open. 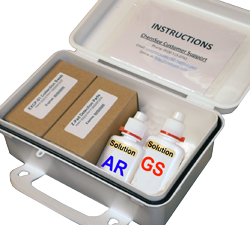 Contains material for testing up to 140 samples for nitrate-based explosives. Tests detect TNT, Nitroglycerin, PETN, RDX, HMX and other nitrate-based explosives. Full color instructions and all materials required for sample collection and testing are provided. The NSK-01S is an enhanced version of the Nitro-Screen Kit. Along with the 140 tests for nitrate-based explosives, the NSK-01PLUS also includes bottles for the detection for Urea Nitrate, Chlorates/Bromates and Peroxides. The NSK-01S is an enhanced version of the Nitro-Screen Kit. Along with the 140 tests for nitrate-based explosives, the NSK-01S includes 5 each of the Verifier, Gel-Ox and Acid Test detectors for explosive precursors.